Handmade Glass Art every month! Why should I choose Glass Art Revealed’s Gift Club? I am passionate about handmade products and the connections forged between consumers and artists! You can rest assured that you or your gift recipient is going to love this gift month after month. How do you choose your monthly selections? Every item I create has been handmade in the flame and is truly one of a kind! I enjoy challenging my skills and learning new glass techniques, along with the creating with all the latest glass from my favorite vendors! Yes! 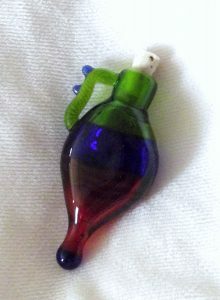 You enjoy a varied selection of unique, handcrafted glass gifts, such as Pendants, Earrings, Zipper Pulls, Wine Stoppers, Wishing Stars, and more! All shipments are delivered in specially-designed packaging to prevent breakage and to ensure safe delivery. I want it to get there in one piece!! Can I choose the items that I’ll receive? Part of the fun of each monthly delivery is the surprise of experiencing my unique one of a kind creations. So, while you cannot specify in advance what items you’ll receive, rest assured that each monthly delivery is sent to you only after having passed the highest standards of fun! What if I don’t like one of the items? Do you offer a guarantee? Your satisfaction is my business! If you’re ever unhappy with my service, you may cancel your membership and receive a full refund for any unshipped merchandise. No questions asked and no additional costs! As long as you like! I offer 2 lengths of service–5 months, and the full Monty–an Ongoing Plan of glassy goodness! 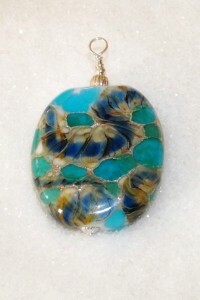 The Glass Art Gift Club Super Saver Ongoing Plan has the added benefit of a lower monthly cost! Of course! Once you’ve completed your purchase, you’ll have the option of sending a gift announcement by U.S. mail or email. I ship all monthly gift clubs to arrive the last week of each month. All shipments are sent by common carrier (FedEx, UPS, or USPS) and are delivered in protective packaging for safe arrival. That depends! Some countries have rather ‘challenging’ postal systems! Please contact me about your specific location. I accept Visa, MasterCard, American Express, Paypal, and seriously good Dark Chocolate. Email ordering is available 7 days a week. READY TO ORDER? GET STARTED NOW!! Order online today or call now, toll-free at 1-877-347-5090! What is the Glass Art Gift Club? Members receive delightful handcrafted glass art . One month the Glass Art Gift Club may include one large item and the next month it could be three smaller items, but generally I send 1-2 items a month. While the total value of the products fluctuates ever-so-slightly, I promise to deliver glass art valued far in excess of your payment. What’s included in my Glass Art Gift Club? Here’s the best part! You won’t know until you open your first box- surprise! No matter what, each month’s box contains unique, wearable glass art, to keep for yourself or enjoy as a perfect gift for someone special. Members love receiving a unique glass surprise in the mail each month as much as I do creating them! For prepaid subscriptions, your credit card will be charged the full amount at the time of purchase. Month-to-month subscriptions will be charged when you first purchase a subscription, and then every 30 days for as long as you remain a member. Certainly! While I would be disappointed to see you go, month-to-month subscriptions can be cancelled at any time. Please email me at [email protected], or call me at 877-347-5090 during business hours. Please note that you will still receive a box after you’ve cancelled your subscription if you’ve already been charged for that month’s box. Unfortunately, prepaid subscriptions cannot be canceled or refunded. However, I will happily transfer the subscription to another recipient. I use an amazing vendor for my shopping cart that recognizes where you are placing the order from, and charges sales tax if applicable for the state in which you are ordering. Most definitely. Glass Art Gift Club is partnering with a trusted subscription platform to manage the subscriptions. My site is PCI Compliant and is rigorously tested for security. Can I change the address throughout the life of the subscription? Definitely. For gifting purposes, many gifters would like to receive the first box of the subscription to hand-deliver it to the recipient, and then change the shipping address to the recipient’s address for future deliveries. If you would like to do this, sign up with your address, then email me at [email protected] to update the shipping address. Note: changing the address in online will only update your billing address. I must update this for you. Since I begin preparations for shipment on the first of the month, the address must be updated no later than the 30th of the month. How do I send an Glass Art Gift Club subscription as a gift? If you would like to give a Glass Art Gift Club subscription as a gift, please check the box that says “Check here if this is a gift” at the beginning of checkout. You’ll then fill out your basic info, the recipient’s info, and a short note that I’ll hand-write and include with their first box. I’m buying this as a gift. Can I include a message to the recipient? Of course! Because I appreciate handmade, I’d love to include a small handwritten note with the lucky recipient’s first box–just provide the message you would like included, please! I’m already a subscriber, but I’m unable to purchase another subscription as a gift. Help! I make it easy to add a gift subscription to your account. All you have to do is email [email protected] with your name and billing zip code, the type of subscription you’d like to purchase, the name of the recipient, and the recipient’s shipping address. I’ll add the subscription to your account and you’ll be billed the same day. When will my first Glass Art Gift Club box ship? How will my Glass Art Gift Box ship? All Glass Art Gift Boxes ship via First Class USPS. What if the product is broken or damaged? What if I don’t like one of the products that I receive? QUESTION STILL NOT ANSWERED HERE? PLEASE CONTACT ME! You, your family, your friends and clients deserve the best, period. Total satisfaction is what I believe, total satisfaction is what I deliver. This is why I offer a 100%, no hassle guarantee on every club subscription purchased. If at any time you are not satisfied with the Glass Art Gift Club or my service, you may choose to cancel the membership at any time. If your subscription was paid in full, I will refund you within 48 hours (Monday through Friday) for any club items that have not been shipped. If you were paying month to month, I will cancel the remaining club items immediately. Subscribe now to the Glass Art Gift Club and get a handmade surprise at your doorstep every month!